When we query a FILESTREAM table using t-SQL, we cannot see the objects. In the below screenshot, you can notice that it shows the metadata for that particular object. As an alternative to display the objects from the FILESTREAM tables, we can use SSRS. Select the ‘Report Server Project Wizard’ from the Business Intelligence -> Reporting Services. You can provide a relevant name for the SSRS report and select the appropriate location. It creates the solution in the directory and opens the SSRS Wizard. In the next page, we need to define the data source. The Data Source needs to point out to the FILESTREAM database with the required authentication method. Enter the details in the connection manager (instance name, Windows or SQL authentication) and database name. We have created the data source now. In the next page, we need to specify the query for the SSRS report. Enter the t-SQL to retrieve the records from the FILESTREAM table and execute it from the run icon as shown below. Click on ‘OK’ to return to report wizard. In the next page, we need to design the SSRS report table to display the required fields. In this article, we do not want to create any group from the available columns, therefore, drag all the columns into the details page. You can view the report summary with the data source and data set information in the next page. Earlier we have given the name to the solution; now we can assign an appropriate name for this SSRS report. You can preview the report here, as well, however we need to do further customization so click on the ‘Finish’. Below is the layout you can see in the SSRS report. Drag the border of the table to give it an appropriate look. Drag the ‘Image’ from the SSIS toolbox to the ‘DocumentBin’ column. It opens the image properties window. Enter the following details in the image properties window. Click on ‘OK’, and you can see a small image icon in the ‘DocumentBin’ column. Click on the ‘Preview’, and you can see the images from the FILESTREAM table. In this screenshot, you can notice that image size is not equal. It does not give an excellent view of the SSRS report. Therefore, click on the ‘Design’ again to do further customization. Right click on the ‘DocumentBin’ column and select image properties. In the image properties, go to size. In this page, you can change the display size and the padding options for the images. 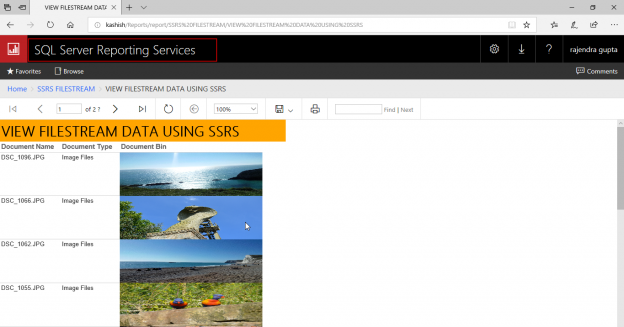 As you can see by default, it displays the images as ‘Fit Proportional’ which means that SSRS will resize the images inside the items while maintaining the aspect ratio. You can also set the padding option here. We will leave the padding option as default. We want to display all the images in a fixed size, therefore, select the option ‘Fit to Size’. It will resize the images to fit inside the item width. Note: You should not change the display option as ‘Original Size’. It will display the complete image as per the original size therefore if we have large size images, the report will not be able to show correctly with other items. Click ‘OK’ and preview the report again. In the above screenshot, you can see that images size is equal for all. It gives a nice look to the SSRS report. Let us do further customization. Currently, the report tile is displayed in a white background. We can change it to the desired colour from the properties. Change the background color as per the requirement. It opens the below configuration page in which we need to provide the ReportServer URL. We need to provide the Report Server URL configured in the Report Server Configuration Manager. Modify the TargetServerURL in the configuration page. Now right click on the Solution and deploy it. You can see the deploy progress in the Output window. It first builds the project and then deploys it on SSRS portal. Click on the folder, and you can see SRS report inside it. Click on the SSRS report to execute it. You can see the SQL Server FILESTREAM images using the SSRS report. In this article, we explored a way to view SQL Server FILESTREAM images using SSRS. We can use a custom application to view the files such as videos, documents etc. We will continue exploring the SQL Server FILESTREAM with additional articles in this series so please stay tuned.